China has & is still playing a crucial developmental role in post-colonial Africa. Transport like railway linestation are important in development more so if it promotes intra-countries trade. As an industrious African, I will countries that are very objective in their technology transfer initiative in Africa. But, where countries like China would come to us with hidden agenda, just to us due of avoidable technical deficiency, it brings more pain to we the younger generation. I still prefer that the Americans and Europeans invest in our continent. Please, I need more info on Chinese engagement with Africa, especially our corrupt leaders. Brilliant infographic and insightful piece. I’m not sure why Andrea inversed the colour ramp in the pie chart vs the map. Now I have to re-read the key because blue is no longer equal to lower numbers / low interest and all of a sudden it a high-interest indicator. Sigh. 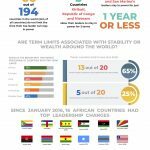 Thank you so much for your detailed look at the infographic! We will definitely be more consistent with the colours next time! 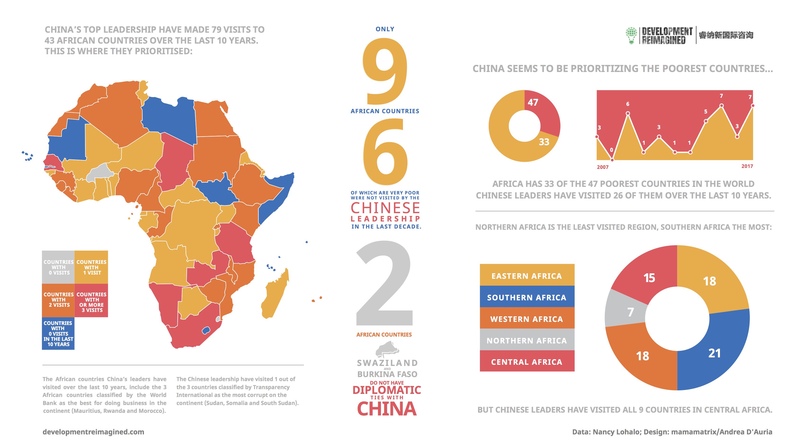 Quite interesting and refreshing approach to looking at Africa-China engagements. Out of interest will it also be feasible to compare Chinese visits with for say developed countries e.g. the USA, U.K, France and see how they each fair? Then we will be able to draw better judgement, not to say we can not now. But congratulations, you have done excellent work, and keep it coming. Cant wait for your 2.0 reloaded….